When you are driving your Porsche, you quickly forget about the world around you. The Navigation & Infotainment Package will keep you informed of what's happening in the world in real time – whether it is with the latest news or the traffic situation on a weekend away with the whole family. 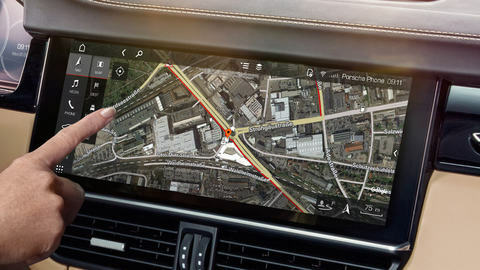 During navigation, you can access real-time traffic information in order to automatically adapt your route and leave traffic jams and slow-moving traffic behind you. You can update your maps using your Internet connection – saving you from a pit stop in the workshop. The satellite map gives you an even better overview of your destination. Use the Online Search in the navigation system to find addresses and points of interest – this is also available using voice control. Create and manage your favourite destinations in My Porsche. You can call up your destinations at any time on any device – laptop, tablet, smartphone or even in your car. And there's no need to synchronise manually. You can also stay up to date while off the road by having your Porsche read out messages or the latest news. You can dictate your own messages to your Porsche using voice control. The Navigation & Infotainment Package also gives you access to a wide range of useful functions. Porsche Connect will tell you where the next petrol station is and what the current fuel prices are, for example.